(LONDON) — Prince William and Duchess Kate made a surprise visit to meet students and parents Thursday to tackle and discuss cyberbullying, one of their most important charitable initiatives. Their latest campaign is an extension of “Stop, Speak, Support” which helps children cope with bullying, and the Duke of Cambridge’s Taskforce on the Prevention of Cyberbullying. 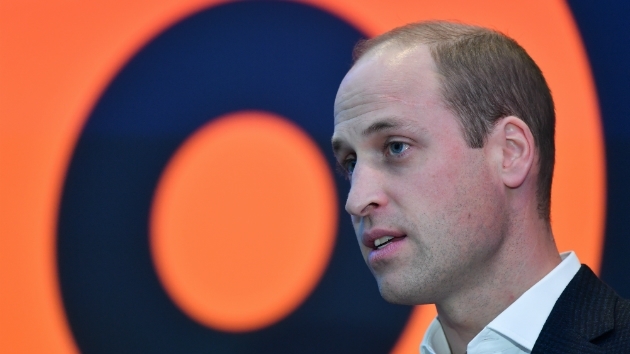 Prince William gave one of the most compelling speeches of his career, lambasting social media companies like Facebook, Google and other social media giants who he doesn’t think are doing enough to protect children from bullying, hate speech, trolling and privacy and are putting profits before the protection of young people. “The noise of shareholders, bottom lines, and profits is distracting them from the values that made them so successful in the first place,” said William, who was moved to act on the issue after speaking to many parents whose children had taken their lives as a result of cyberbullying. The Duke of Cambridge’s speech coincides with Anti-Bullying Week in the U.K.
William and Kate’s visit Thursday to the BBC follows a busy few days for the couple. They spent Wednesday in Yorkshire, where they visited Centrepoint, the homeless charity that William took over as patron in 2005, following in the footsteps of his mother, Princess Diana, who served as patron until her death. Both Prince William and his brother Prince Harry made private visits to the charity as children with Princess Diana and it has been particularly important for William to carry on her work on behalf of the homeless. On Wednesday evening, both the Duke and Duchess of Cambridge and Duke and Duchess of Sussex attended the birthday party thrown by Queen Elizabeth to celebrate the 70th birthday of William and Harry’s father, the Prince of Wales. Kate, the Duchess of Cambridge, was dressed in an off-the-shoulder pink dress accessorized by a pair of statement chandelier diamond earrings that she last wore to the BAFTAS in 2017. Meghan, the Duchess of Sussex, also wore a pair of borrowed earrings which she was last seen wearing in Fiji. The Queen made a poignant toast to Prince Charles at the black-tie event. The party was attended by numerous royal families around the world, including King Juan Carlos and Queen Sofia of Spain, Crown Prince Frederik and Crown Princess Mary of Denmark, Queen Rania of Jordan, King Harald and Queen Sonja of Norway and Prince Albert of Monaco.